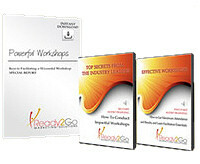 About Ready2Go Marketing Solutions, Inc.
Ready2Go Marketing Solutions are completely developed, off the shelf, ready to deliver Audio Training Programs, Self-study Coaching Programs, Special Reports, Speeches, Success Tips,Teleseminars, Tweets, and Workshops - also available in Package Bundles and Starter Packs! No need to get bogged down with content creation, we've created all these ready made products for you. All you do is customize them with your own message and voice, brand to fit your own business needs, and then implement. We offer a full suite of products that allow you to get in front of your market with compelling products, continue to stay in touch, nurture relationships and constantly give value, thereby converting more clients than ever before! There are a variety of topics to choose from, and more coming soon. Meet the team or learn more about our products!